Joe Bloggs is a Program Director of a two-module executive program taking place over 3 months. There are 30 managers participating, from different companies and different locations around the world. 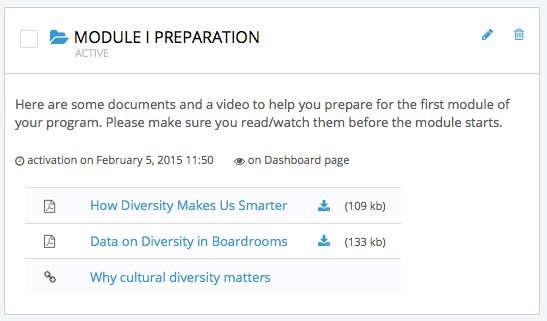 For each module, the participants are assigned to workgroups (6 workgroups of 5 people each). Each workgroup is assigned a dedicated coach. Joe’s program delivers lots of great material to the participants but there is always so little time to cover everything, and he knows that the course time and readings can only go so far in having impact. To get more from the program, the participants need to be challenged to try things themselves, and to learn from others and get feedback. There isn’t enough time to cover it all during the modules. He used to manage some follow-up by phone calls and email but it was tedious to organise and difficult to track. 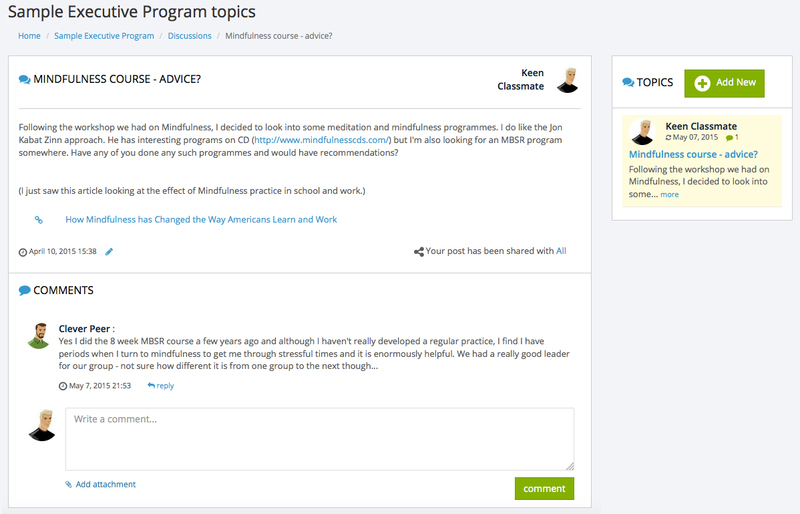 Then Joe found AmphiHQ which allows him to expand his program by having a space online for reflection and exchange – allowing the participants to go deeper with the learning, and the administration to have an easy and efficient system to manage. Click through the tabs here on the left to see how they use the different features of AmphiHQ to extend and enrich their program. 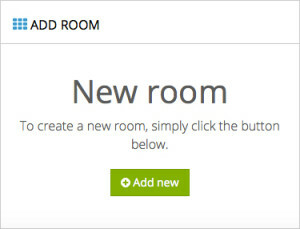 Joe Bloggs, together with the program coordinator, Jane Smith, arrange to have a dedicated URL on the AmphiHQ platform where they can create separate ‘Rooms’ for each program they run, and for each cohort of the programs. As the platform administrator, Jane creates a new “Room” for the new program and adds Joe as the Director. 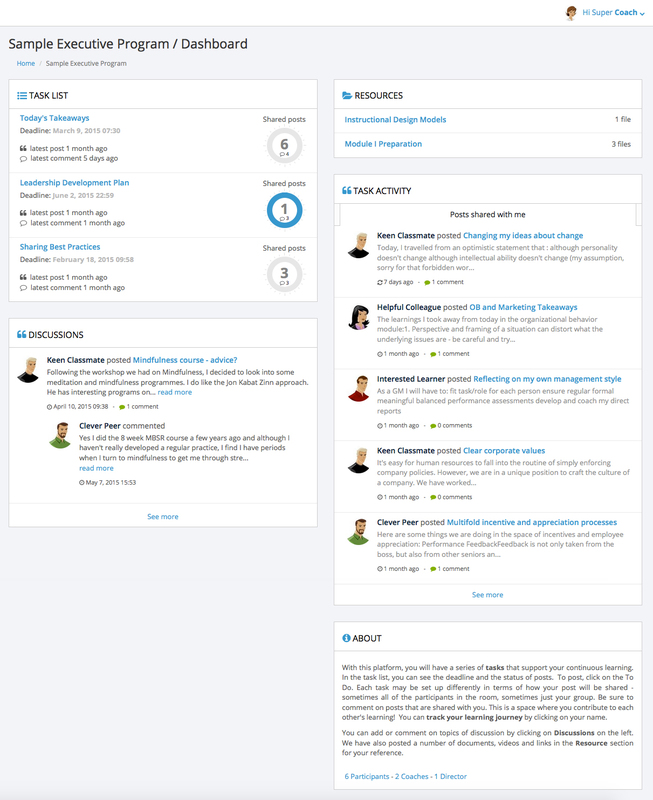 The list appears, showing their roles and their workgroups. A few people join the program closer to the start date. She can add them one-by-one or upload a new spreadsheet. Whenever she is ready to invite them to the online space, she can just select the people and click to send out the logins. Each person receives an individual email notification with his/her username and password. They want to use the platform to share documents, videos and links throughout the programme. 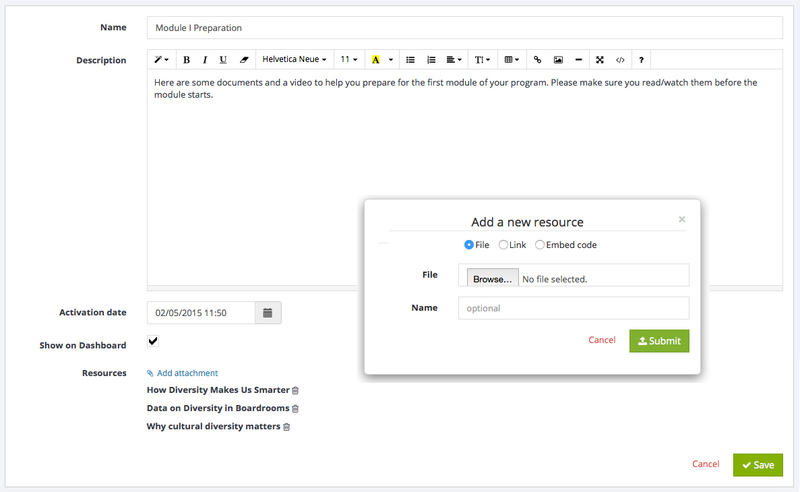 First, they click on ‘Resources’ and add a bundle that they call Module I Preparation. They put in a description then upload a set of documents and put in links to some videos. They click to show this Resource bundle on the Dashboard so the participants see it on the first screen when they login. Jane also wants to prepare forward. She creates a few more Resource bundles and sets the activation dates/times for when she wants them to be released to the participants. For now, she can see them on her login but the participants will see them only when activated. Joe wants to engage the participants with assignments to post and share things. Step 1, he defines what is each task. He gives it a name and a description/instructions. He can attach files or links so if there is something for people to read/watch or a template to complete, it is conveniently on the task page. 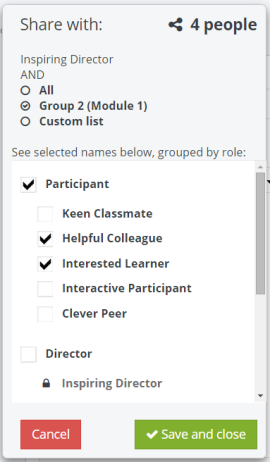 Step 2, he indicates who is assigned – be it all of the participants or specific workgroups. 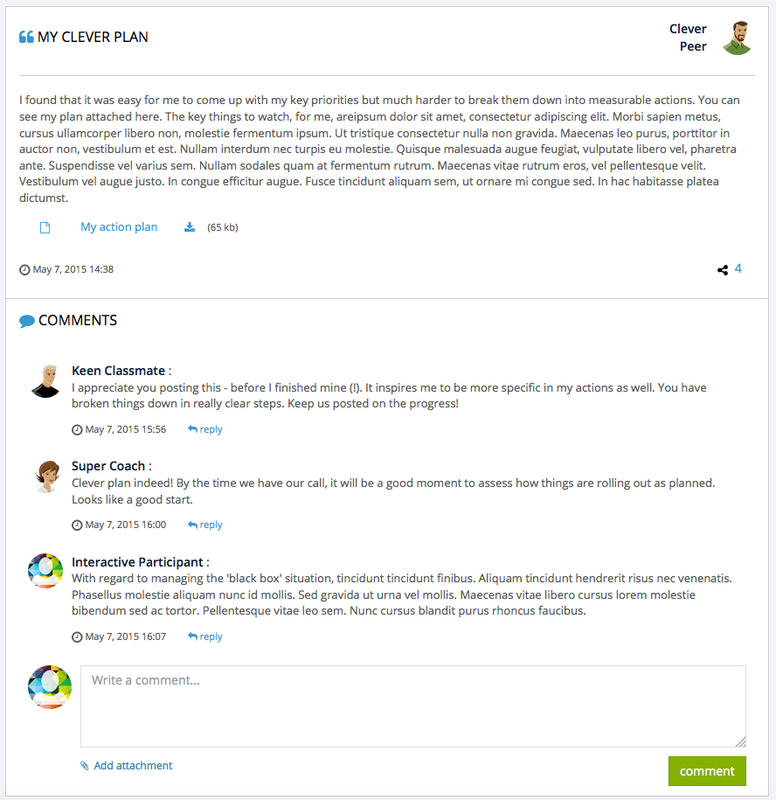 He also can select how the posts will be shared by naming task facilitators who get to see all of the posts and choosing whether the posts are shared with all of the participants or just their own workgroups, including the coaches too or perhaps nobody else. The sharing rule can either be fixed or he can allow each participant to edit the default and choose with whom they want to share. Step 3 is ‘when‘. He can set the activation date, put in a deadline or multiple deadlines, and set a closing a date if he doesn’t want people to be able to post after a certain date/time. Like the Resources, the Tasks can be planned ahead of time for later release to the participants – or they can be set up and activated immediately. Joe wants to have a task for the participants to complete before they come on the program – as a means of introducing themselves to their workgroups and getting people in the mindset for the management topics they’ll be discussing. The task he assigns is for the participants to share a best practice story from their organisation. To keep it more personal, he sets it so each person’s post is shared only with the others in their workgroup, rather than with everyone on the program. They decide on a deadline for a week before Module 1 so that the group mates have time to view and add comments on each others’ posts before they arrive. Before the module starts, Jane can easily see who has completed the task and send out a reminder. Joe looks at some of the ideas that are posted to prepare. He can see who is actively participating in advance. During Module I, Joe wants the participants to take a few minutes each evening to reflect on the concepts and insights from the day and share some of their key takeaways with each other. 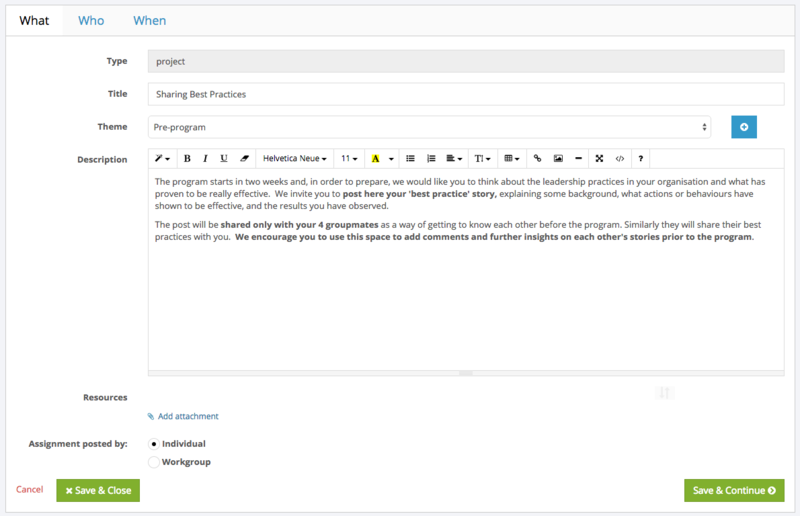 He sets up a task for them to post their Daily Reflections, assigned to all of the Participants, and this time set to share by default with everyone in the Room but allowing the participants to edit the list and share with just their group or a custom selection of people. For this task, they have been allowed to edit how their posts are shared. They click to see the popup and can select their group or specific individuals if they don’t want to share with everyone. Each morning of the program, he projects the feed of posts that were shared with everyone in the classroom and gives people another few minutes to add posts and comments using their mobile devices. At the end of the first module, they have a coaching session with their group. The coach asks the participants to define an action plan and share it with their group. Jane sets up the task, assigning the participants, and setting the sharing with their group and coach. 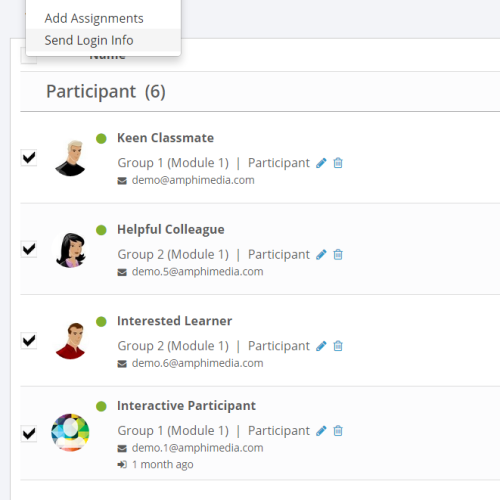 The coaches can find the follow-up of the module all in one place and be able to keep track easily of each of the participants in their group. 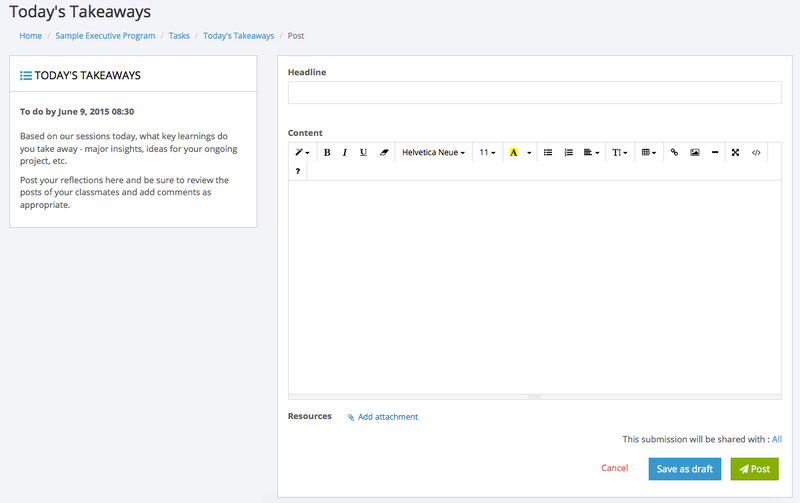 In addition to the resources and tasks that are set up by the administration of the program, there is a space for the participants to post their own topics of discussion. They can share their topics with everyone in the room or just with their workgroup. 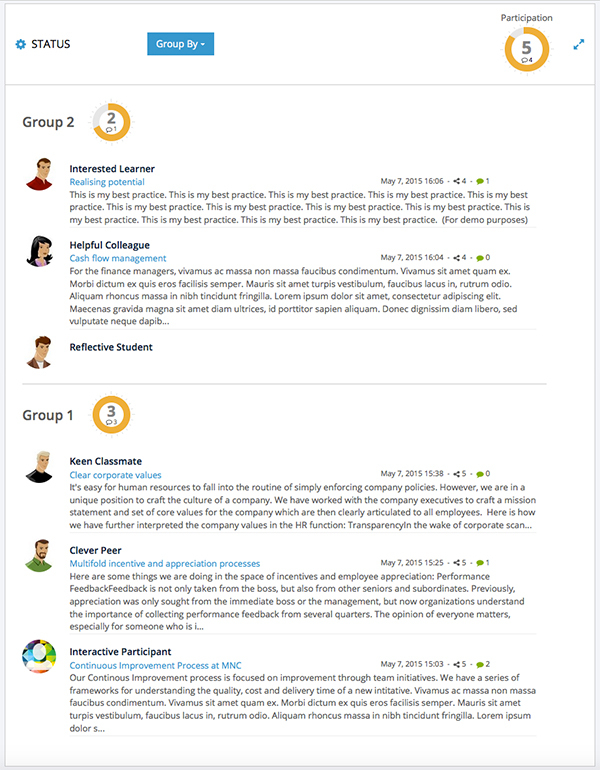 Throughout the program, the participants can login to their Room to see and comment on the posts of their colleagues, access the Resources that are shared, and add and comment on topics of Discussion. The participants can view and download their ‘Journey’ as a tangible reminder of their learnings and an overview of their progress. 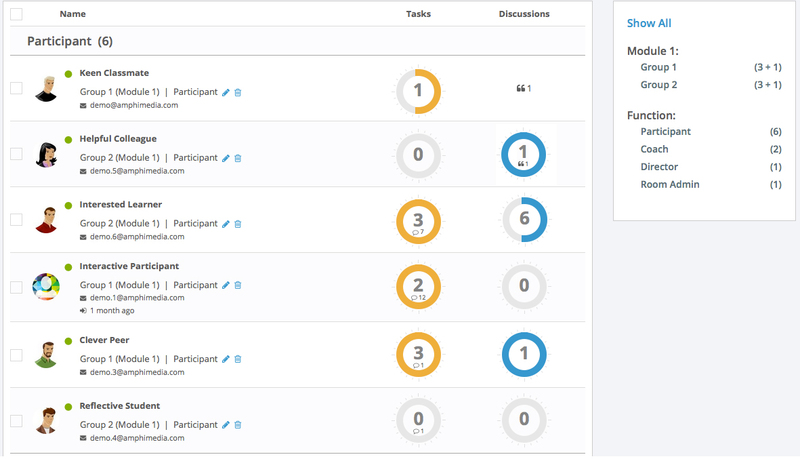 The administrator of the Room can easily track who has completed their assigned tasks, the number of comments they’ve posted to their peers, and their activity in discussions.